The Hall Street wastewater facility in Concord, NH, was experiencing dust levels that raised a potential concern. Tech Environmental was retained to analyze lime dust levels in the air at the facility, develop a respiratory plan, and make dust control recommendations. 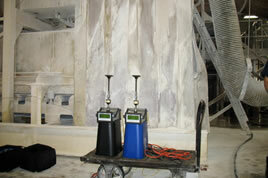 Both fine and coarse particulate matter was measured using DataRAM monitors in the RDP room of the facility. Monitoring was performed proximate to the "worst area" of lime dust emissions to ensure full conservativism. Tech reviewed all applicable data and material related to these emissions, and spoke with facility staff at length to gain a full appreciation of the situation. The evaluation compared dust levels to applicable standards and suggested improvements to the facility's dust control procedures. A wastewater treatment plant in Concord, NH, sought assistance with potentially troublesome levels of lime dust in ambient air inside the facility. Tech Environmental performed air monitoring and suggested improvements to ensure worker safety.